Miguel A. Martinez - CEO of Wee Wigglers Corp.
Miguel has been working with youth across Canada for over 17 years, and served as a Christian missionary in Puerto Rico for two years. He has worked with a variety of groups and is passionate about instilling soft skills at an early age. Through his experience in Fortune 500 companies, Miguel understands the important of providing tools and motivation to his participants. While growing up, and to this day, Miguel finds comfort in music and dance. He used to dance for MuchMusic and choreographed and danced all across Canada. 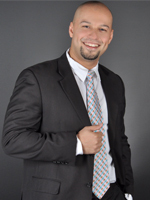 As a talented motivational speaker, entrepreneur, and experienced sales person, Miguel has the life experience necessary to provide practical, real world advice. With an electric smile, and infectious enthusiasm, he is able to capture the attention of young people, and keep them engaged from the start of a workshop to the end.